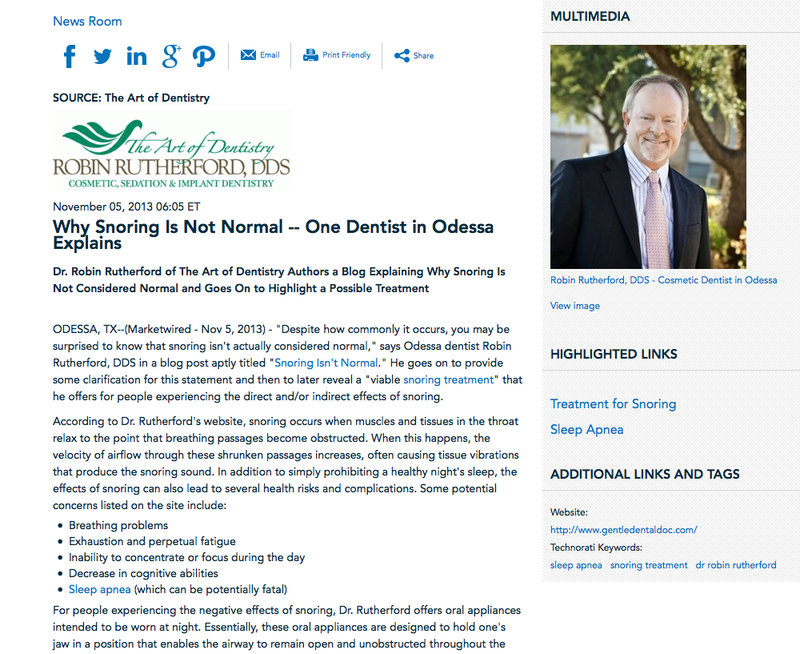 Odessa, TX — “Despite how commonly it occurs, you may be surprised to know that snoring isn’t actually considered normal,” says Odessa dentist Robin Rutherford, DDS in a blog post aptly titled “Snoring Isn’t Normal.” He goes on to provide some clarification for this statement and then to later reveal a “viable snoring treatment” that he offers for people experiencing the direct and/or indirect effects of snoring. For people experiencing the negative effects of snoring, Dr. Rutherford offers oral appliances intended to be worn at night. Essentially, these oral appliances are designed to hold one’s jaw in a position that enables the airway to remain open and unobstructed throughout the night, therefore limiting the tissue vibrations in the throat that produce the snoring sound. Each oral appliance constructed by Dr. Rutherford is custom-made to fit comfortably and securely in the patient’s mouth as they sleep. An honors graduate of Texas A&M, Dr. Rutherford earned his dental degree from the University of Texas Dental School at San Antonio. At The Art of Dentistry, he offers a comprehensive range of general, cosmetic, and advanced dental services spanning from oral exams and teeth whitening, to porcelain veneers and TMJ treatment. Dr. Rutherford is also an active member of the American Academy of Cosmetic Dentistry and the American Orthodontic Society, as well as a Fellow of the Dental Organization for Conscious Sedation – an achievement attained by less than 2% of dentists practicing sedation techniques. He is available for interview upon request. For more information about Dr. Rutherford and The Art of Dentistry, visit gentledentaldoc.com, plus.google.com/101709950170033120687/about, and facebook.com/gentledentaldoc.